I recently had a customer ask if there was a way to use one of our AC sources to determine whether the load connected to its output was capacitive or inductive. 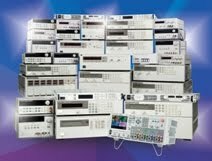 Agilent’s 6811B, 6812B, and 6813B AC power source/analyzers are all capable of making many different measurements, several of which can be used to calculate the impedance of the connected load. To determine the impedance, the simplest measurements to use are the amplitude and phase measurements of the applied sine wave voltage and resultant current. 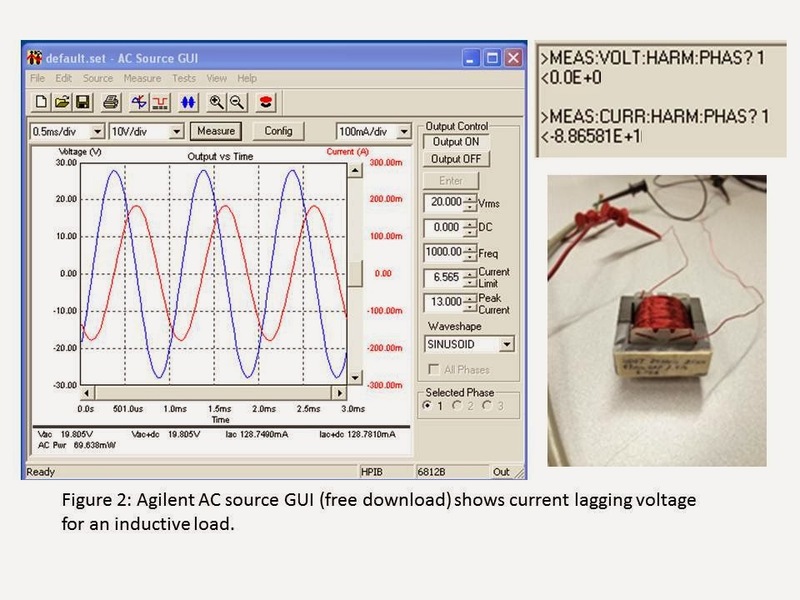 Agilent’s AC sources can measure harmonic content of the voltage and current, both amplitude and phase, up to the 50th harmonic. From these measurements, you can calculate the impedance of the R, L, or C connected to the AC source output. I grabbed a few sample parts from our lab area to demonstrate these measurements. First, I used a power resistor that was about 49 ohms. I applied a sine wave of about 20 Vac at 1000 Hz (0 phase) and used the built-in measurement capability to measure about 0.4 Aac at a phase (angle) of very near 0 degrees (the measurement was -7.01E-2 = -0.071 degrees). Of course, 0 degrees of phase between the voltage and current means the sine waves are in phase and the load is resistive as expected. See Figure 1. The next test I did was with an inductor. Connecting it to the output of the AC source and once again applying about 20 Vac at 1000 Hz from the AC source, using the built-in measurement capability, I measured about 0.129 Aac at a phase of -88.66 degrees. The phase measurement of nearly -90 degrees confirmed that the load on the AC source was an inductor and the magnitude could be calculated to be about 25 mH which is what I expected (I measured it using an Agilent LCR meter). The series resistance in the line cord, clip leads, and inductor wire itself (I did not use remote sense) accounted for the non-ideal phase of -88.66 degrees instead of the ideal phase of -90 degrees. And the R was calculated from the AC source measurements to be about 3.6 ohms and agreed with external verification. See Figure 2. 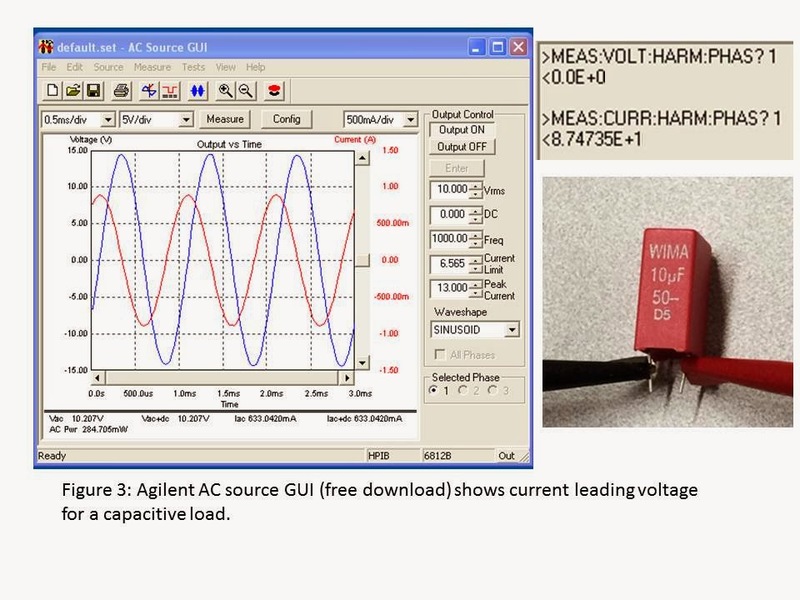 Finally, I connected a capacitor to the AC source output and applied about 10 Vac at 1000 Hz. The AC source measurement system showed 0.633 Aac at an angle of 87.47 degrees indicating a capacitor was across its output. From these measurements, the capacitance and series R were calculated to be 9.88 uF and 0.711 ohms, consistent with externally verified measurements. See Figure 3. 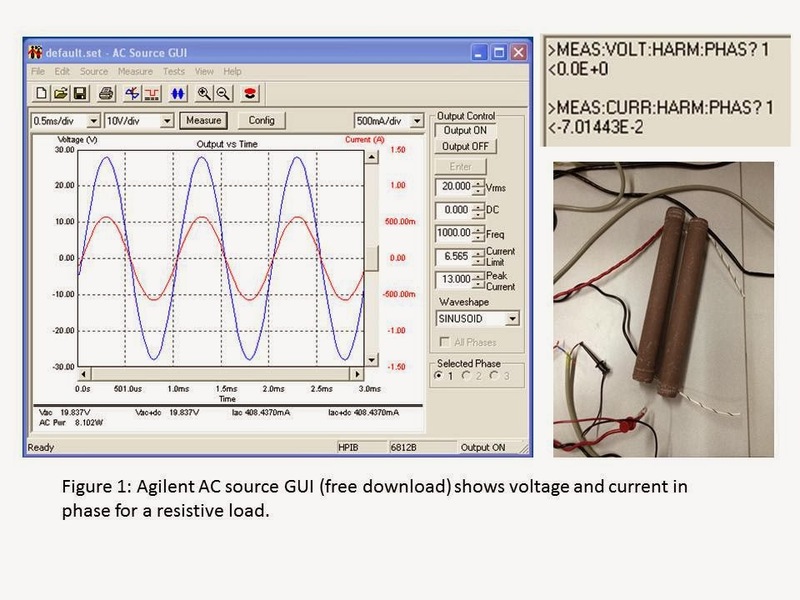 So you can see that it is possible to determine the impedance (resistance, capacitance, or inductance) of a device connected across the output of an AC source when the right measurement capabilities are built into the AC source, as they are with the Agilent AC sources. These highly capable products not only make measurements like this easy, they also can easily create a large variety of AC output stimulus waveforms.